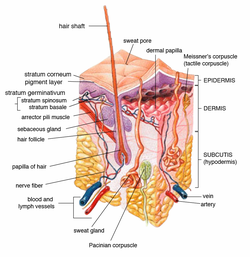 The human skin is the outer covering of the body and is the largest organ of the integumentary system. The skin has up to seven layers of ectodermal tissue and guards the underlying muscles, bones, ligaments and internal organs. Human skin is similar to most of the other mammals skin, and it is very similar to pig skin. 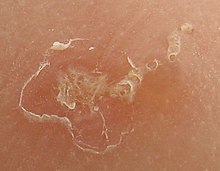 Though nearly all human skin is covered with hair follicles, it can appear hairless. There are two general types of skin, hairy and glabrous skin (hairless). The adjective cutaneous literally means "of the skin" (from Latin cutis, skin). In terms of surface area, the skin is the second largest organ in the human body (the inside of the small intestine is 15 to 20 times larger). For the average adult human, the skin has a surface area of between 1.5-2.0 square metres (16.1-21.5 sq ft.). The thickness of the skin varies considerably over all parts of the body, and between men and women and the young and the old. An example is the skin on the forearm which is on average 1.3 mm in the male and 1.26 mm in the female. The average square inch (6.5 cm²) of skin holds 650 sweat glands, 20 blood vessels, 60,000 melanocytes, and more than 1,000 nerve endings. [better source needed] The average human skin cell is about 30 micrometres in diameter, but there are variants. A skin cell usually ranges from 25-40 micrometres (squared), depending on a variety of factors. ^ a b Marks, James G; Miller, Jeffery (2006). Lookingbill and Marks' Principles of Dermatology. (4th ed.). Elsevier Inc. ISBN 1-4160-3185-5. ^ a b Proksch, E; Brandner, JM; Jensen, JM (2008). "The skin: an indispensable barrier". Experimental Dermatology. 17 (12): 1063–72. doi:10.1111/j.1600-0625.2008.00786.x. PMID 19043850. ^ a b c Madison, KC. (2003). 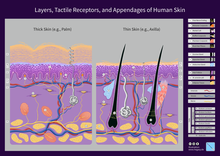 "Barrier function of the skin: "la raison d'être" of the epidermis" (PDF). J Invest Dermatol. 121 (2): 231–41. doi:10.1046/j.1523-1747.2003.12359.x. PMID 12880413. ^ a b c Grice, E. A.; Kong, H. H.; Conlan, S.; Deming, C. B.; Davis, J.; Young, A. C.; Bouffard, G. G.; Blakesley, R. W.; Murray, P. R. (2009). "Topographical and Temporal Diversity of the Human Skin Microbiome". Science. 324 (5931): 1190–2. doi:10.1126/science.1171700. PMC 2805064. PMID 19478181. ^ Maton, Anthea; Jean Hopkins; Charles William McLaughlin; Susan Johnson; Maryanna Quon Warner; David LaHart; Jill D. Wright (1893). Human Biology and Health. Englewood Cliffs, New Jersey, USA: Prentice Hall. ISBN 978-0-13-981176-0. ^ a b Wilkinson, P.F. Millington, R. (2009). Skin (Digitally printed version ed.). Cambridge: Cambridge University Press. pp. 49–50. ISBN 978-0-521-10681-8. ^ Bennett, Howard (25 May 2014). "Ever wondered about your skin?". The Washington Post. Retrieved 27 October 2014. ^ a b Stücker, M.; A. Struk; P. Altmeyer; M. Herde; H. Baumgärtl; D. W. Lübbers (2002). "The cutaneous uptake of atmospheric oxygen contributes significantly to the oxygen supply of human dermis and epidermis". The Journal of Physiology. 538 (3): 985–994. doi:10.1113/jphysiol.2001.013067. ISSN 0022-3751. PMC 2290093. PMID 11826181. ^ Edqvist, Per-Henrik D.; Fagerberg, Linn; Hallström, Björn M.; Danielsson, Angelika; Edlund, Karolina; Uhlén, Mathias; Pontén, Fredrik (19 November 2014). "Expression of Human Skin-Specific Genes Defined by Transcriptomics and Antibody-Based Profiling". Journal of Histochemistry & Cytochemistry. 63 (2): 129–141. doi:10.1369/0022155414562646. PMC 4305515. PMID 25411189. ^ Muehlenbein, Michael (2010). Human Evolutionary Biology. Cambridge University Press. pp. 192–213. ISBN 978-1139789004. ^ Jablonski, N.G. (2006). Skin: a Natural History. Berkeley: University of California Press. ISBN 978-0520954816. ^ Jablonski, N.G. ; Chaplin (2000). "The evolution of human skin coloration". Journal of Human Evolution. 39 (1): 57–106. doi:10.1006/jhev.2000.0403. PMID 10896812. ^ "The Fitzpatrick Skin Type Classification Scale". Skin Inc. (November 2007). Retrieved 7 January 2014. ^ "Fitzpatrick Skin Type" (PDF). Australian Radiation Protection and Nuclear Safety Agency. Archived from the original (PDF) on 31 March 2016. Retrieved 7 January 2014. ^ Gilchrest, BA (1990). "Skin aging and photoaging". Dermatology Nursing / Dermatology Nurses' Association. 2 (2): 79–82. PMID 2141531. ^ WI, Kenneth Todar, Madison. "Immune Defense against Bacterial Pathogens: Innate Immunity". textbookofbacteriology.net. Retrieved 19 April 2017. ^ NIH Human Microbiome Project. ^ Baroli, Biancamaria (2010). "Penetration of nanoparticles and nanomaterials in the skin: Fiction or reality?". Journal of Pharmaceutical Sciences. 99 (1): 21–50. doi:10.1002/jps.21817. ISSN 0022-3549. PMID 19670463. ^ Filipe, P.; J.N. Silva; R. Silva; J.L. Cirne de Castro; M. Marques Gomes; L.C. Alves; R. Santus; T. Pinheiro (2009). "Stratum Corneum Is an Effective Barrier to TiO2 and ZnO Nanoparticle Percutaneous Absorption". 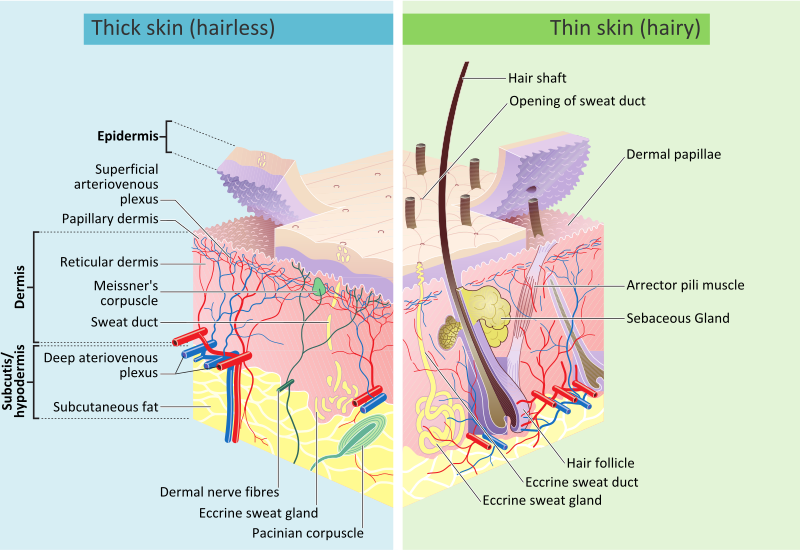 Skin Pharmacology and Physiology. 22 (5): 266–275. doi:10.1159/000235554. ISSN 1660-5535. PMID 19690452. ^ a b Vogt, A.; Combadiere, B.; Hadam, S.; Stieler, K.; Lademann, J.; Schaefer, H.; et al. (June 2006). "40 nm, but not 750 or 1,500 nm, nanoparticles enter epidermal CD1a+ cells after transcutaneous application on human skin". 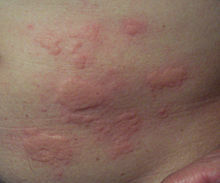 Journal of Investigative Dermatology. 126 (6): 1316–22. doi:10.1038/sj.jid.5700226. PMID 16614727. ^ Sonavane, Ganeshchandra; Keishiro Tomoda; Akira Sano; Hiroyuki Ohshima; Hiroshi Terada; Kimiko Makino (2008). "In vitro permeation of gold nanoparticles through rat skin and rat intestine: Effect of particle size". Colloids and Surfaces B: Biointerfaces. 65 (1): 1–10. doi:10.1016/j.colsurfb.2008.02.013. ISSN 0927-7765. PMID 18499408. ^ a b Ryman-Rasmussen, J. P. (2006). "Penetration of Intact Skin by Quantum Dots with Diverse Physicochemical Properties". Toxicological Sciences. 91 (1): 159–165. doi:10.1093/toxsci/kfj122. ISSN 1096-6080. PMID 16443688. ^ Felipe, P.; Silva, J.N. ; Silva, R.; Cirne de Castro, J.L. ; Gomes, M.; Alves, L.C. ; et al. (2009). "Stratum Corneum Is an Effective Carrier to TiO2 and ZnO Nanoparticle Percutaneous Absorption". Skin Pharmacology and Physiology. 22 (5): 266–275. doi:10.1159/000235554. PMID 19690452. ^ Larese, Francesca Filon; Flavia D’Agostin; Matteo Crosera; Gianpiero Adami; Nadia Renzi; Massimo Bovenzi; Giovanni Maina (2009). "Human skin penetration of silver nanoparticles through intact and damaged skin". Toxicology. 255 (1–2): 33–37. doi:10.1016/j.tox.2008.09.025. ISSN 0300-483X. PMID 18973786. ^ Mortensen, Luke J.; Gunter Oberdörster; Alice P. Pentland; Lisa A. DeLouise (2008). "In Vivo Skin Penetration of Quantum Dot Nanoparticles in the Murine Model: The Effect of UVR". Nano Letters. 8 (9): 2779–2787. doi:10.1021/nl801323y. ISSN 1530-6984. PMC 4111258. PMID 18687009. ^ a b c d Osinski, Marek; Luke Mortensen; Hong Zheng; Renea Faulknor; Anna De Benedetto; Lisa Beck; Lisa A. DeLouise; Thomas M. Jovin; Kenji Yamamoto (2009). "Increased in vivo skin penetration of quantum dots with UVR and in vitro quantum dot cytotoxicity". Colloidal Quantum Dots for Biomedical Applications IV. 7189: 718919–718919–12. doi:10.1117/12.809215. ISSN 0277-786X. ^ a b Mortensen, L.; Oberdorster, G.; Pentland, A.; DeLoiuse, L. (2008). "In Vivo Skin Penetration of Quantum Dot Nanoparticles in the Murine Model: The Effects of UVR". Nano Letters. 8 (9): 2779–2787. doi:10.1021/nl801323y. PMC 4111258. PMID 18687009. ^ Sokolov, K.; Follen, M.; Aaron, J.; Pavlova, I.; Malpica, A.; Lotan, R.; et al. (May 2003). "Real-Time Vital Optical Imaging of Precancer Using Anti-Epidermal Growth Factor Receptor Antibodies Conjugated to Gold Nanoparticles". Cancer Research. 63: 199. ^ a b c Prausnitz, M.; Mitragotri, S.; Langer, R. (February 2004). "Current Status and Future Potential of Transdermal Drug Delivery". Nature Reviews. Drug Discovery. 3 (2): 115–124. doi:10.1038/nrd1304. PMID 15040576. ^ Gao, X.; Cui, Y.; Levenson, R.; Chung, L.; Nie, S. (2005). "In vivo cancer targeting and imaging with semiconductor quantum dots". Nature Biotechnology. 22 (8): 969–976. doi:10.1038/nbt994. PMID 15258594. ^ "Nanotechnology Information Center: Properties, Applications, Research, and Safety Guidelines". American Elements. ^ Shapiro SS, Saliou C (2001). "Role of vitamins in skin care". Nutrition. 17 (10): 839–844. doi:10.1016/S0899-9007(01)00660-8. PMID 11684391. ^ "Foods for healthy skin".